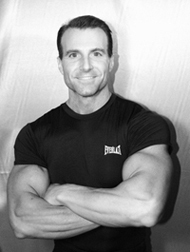 Tom Venuto is a natural bodybuilder, certified strength and conditioning specialist (CSCS) and a certified personal trainer (CPT). I've learned so much from Tom through is e-book, Burn the Fat, Feed the Muscle. No hype, no gimmicks -- Tom shoots straight from the hip, and tells you the truth about fat loss. First, she mixes up a light, fluffy, vanilla cake mix, pours it into the pans and then pops it in the oven. After it's been baked, she stacks the cake in two layers with whipped cream spread generously between each layer. She then pours on red and green Jell-O, which gets soaked up inside the cake. Next, whipped cream is smothered all the way around for frosting. And finally, she garnishes it with red and green sprinkles. A few red and green-striped candy canes are stuck in the top as the finishing touch, and off it goes to the refrigerator so it can be served chilled later. Now let me tell you, as a bodybuilder, I have a lot of discipline. But when that moist, delicious, red and green, Jell-O-filled, whipped-cream covered cake is sitting on the table in front of me on December 25th, it takes every ounce of my willpower to keep from calling it a "VERY high carb day" and devouring numerous very large slices. Despite the temptation, I don't "pig out" nor do I deprive myself. Instead, I'm content with eating my single piece, savoring every mouthwatering bite, all the while repeating my mantra, "Nothing tastes as good as being lean feels." The next day, on December 26th, I’m on the bike or Stairmaster at the crack of dawn, followed by six perfect meals of lean protein and complex carbohydrate - just like every other day of the year. And here’s the point: You can and should enjoy the holidays. You can enjoy being with family and going out with friends. You can go to holiday parties and have fun. You can enjoy a few “naughty” meals. You can have a piece of cake and a glass or two of champagne. There’s no reason why you can’t enjoy yourself AND stay healthy, lean and fit through the holidays. All it takes is some planning, some goal-setting and little dose of old-fashioned discipline. If you follow this advice, then you’ll be one of the proud few with a New Year’s resolution to be the best you’ve ever been in the new year to come - instead of one of the guilt-ridden many who must resolve to reclaim what they lost over the year that’s just passed them by. You can avoid this trap by planning to succeed during the holidays. Set up a positive expectation. Resolve now that you will not tolerate slipping backwards. Keep your standards up and don’t settle! Not only can you plan to “stay in shape” over the holidays, you can plan to improve! All you have to do is make the decision and expect success. Set a goal to lose the 25 lbs you’ve always wanted to lose NOW Set the goal to gain 10 lbs of solid muscle NOW Been contemplating a competition in bodybuilding, fitness or the new ladies figure division? Pick an early spring show and GO FOR IT - START TRAINING NOW! I’ve never met anyone who was truly serious about fat loss or bodybuilding who was a heavy drinker. Alcohol and muscles just don’t mix. The impact goes beyond added body fat; your energy levels and workouts can be affected for days after a night of heavy drinking. A glass of wine may have health benefits, but there’s never any reason or excuse for binge drinking or getting drunk. So go ahead and toast to the New Year, but know when to say when. In conclusion, there’s no reason to let your exercise and nutrition program spoil your holidays, but there’s also no reason to let your holidays spoil your exercise and nutrition program! Put these 10 holiday tips into practice and you can start losing fat today, not next year. Train hard and expect success, Tom Venuto, NSCA-CPT, CSCS Fat Loss Coach.